Millions of food stamp recipients can expect to see their benefits reduced beginning in November-and that could end up being just the beginning of deeper cuts to the food stamp program. The modern-day food stamp plan, now called the Supplemental Nutrition Assistance Program, is scheduled to scale back benefits for all recipients next month because a recession-era boost in benefits is expiring. The cut comes as lawmakers also are considering billions of dollars of cuts to the overall SNAP program, which has grown substantially in recent years amid the weak economy and high unemployment. The program is now serving more than 23 million households, or nearly 48 million people, according to the most recent government data through June. The average monthly benefit is about $275 per household, according to the USDA. The exact reduction that families will see beginning Nov. 1 depends on the recipients' situation, but a family of four with no changes in circumstance will receive $36 less per month, according to the USDA. Stacy Dean, vice president for food assistance policy at the Center on Budget and Policy Priorities, said her analysis found that the change will mean that the average benefit will go from about $1.50 per person, per meal each month to about $1.40 per person, per meal. "For those of us who spend $1.70 a day on a latte this doesn't seem like a big change, but it does kind of really highlight the millions of families living on an extremely modest food budget," she said. Others are less worried about the immediate cuts. Parke Wilde, associate professor at the Friedman School of Nutrition at Tufts University, said that in real dollars, the cuts brings the program's aid levels back in line with where they were in the mid-2000s, before benefits were boosted as part of the American Reinvestment and Recovery Act. "That's neither great nor terrible," Wilde said. He said the bigger issue is the debate in Congress over whether, and how much, the SNAP program could be cut in years to come. The House of Representatives passed a bill in mid-September that would eliminate about $39 billion form the SNAP budget over 10 years, while the Senate has approved a bill that makes much smaller cuts to the program. The final decision could result in some recipients getting dropped from the program completely at a time when many are still recovering from the effects of the deep recession, he said. "We have a very spare cash-based safety net and we rely a lot on food stamps to give people the resources they need to avoid hunger," Wilde said. The SNAP program has become a last resort for people like Angela Phillips, 44, who never thought that she would be in a position where she would have to accept food stamps. Phillips, who is divorced with three kids, worked for years as a paralegal and executive assistant, at one point making about $45,000 a year. Then the economy turned, and she suffered a string of job losses along with some health issues related to a shoulder injury from her time serving in the Army years ago. Phillips, who lives in Knoxville, Tenn., said she juggled things as best she could for a long time, eating little while her kids were with their dad so she could feed them well when they were staying with her. Still, she said she struggled to explain why she couldn't always give them pricier, healthy foods like fresh fruit. She ended up applying for SNAP benefits in July of 2012, while working part time. "It was a huge benefit for me to be able to know that I could feed my family," she said. Phillips is currently working as a temporary administrative assistant for a national lab, but the employment is erratic and she says she makes about $17,000 a year. She's also a full-time student. She recently had a long period of steady employment and was able to go off food stamps, but that temporary position ended Friday and she doesn't know when she'll get another stable position. That means she'll be applying for food stamps again on Monday. Phillips said she collected about $600 a month previously, and she doesn't yet know what her benefit will be this time, with the new reductions. "I could make it work for a bit smaller benefit," she said. "If it was a lot different, then I would have a difficult time." State agencies that administer the food stamp benefit say they are trying to get the word out about the benefit reduction. Alexis Lambert, communications director for the Florida Department of Children and Families, said they have hung flyers, added a notice to the website and put an announcement on their call center hold message. In Kansas, Theresa Freed, director of communications for the state's Department for Children and Families, said the state agency has provided recipients with an estimate of what kind of reduction they will see. It also is notifying community partners that they could see an increase in demand for their services. Some food banks also are preparing for the change. Eric Cooper, chief executive of the San Antonio Food Bank in Texas, said he estimates that a typical SNAP benefit is enough for a family to buy food for two and a half to three weeks. 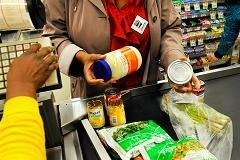 With the reduction, he expects SNAP benefits to typically last for two to two and a half weeks. "It's going to place a lot more demand on us for kind of 'food for today' type strategies," he said. "Our emergency food and the need for more assistance is going to be greater." -By CNBC's Allison Linn. Follow her on Twitter @allisondlinn and Google or send her an email .